Once upon a time a mother goose and her lifelong mate chose to raise their young on a feedlot in Nebraska. They chose to stay in Nebraska rather than continue the flight north with the rest of their flock. The built their nest, laid the eggs and raised their fuzzy-haired little goslings on the feedlot holding pond. The family of six were left pretty much alone as they spent their summer swimming around on the six acre pond. 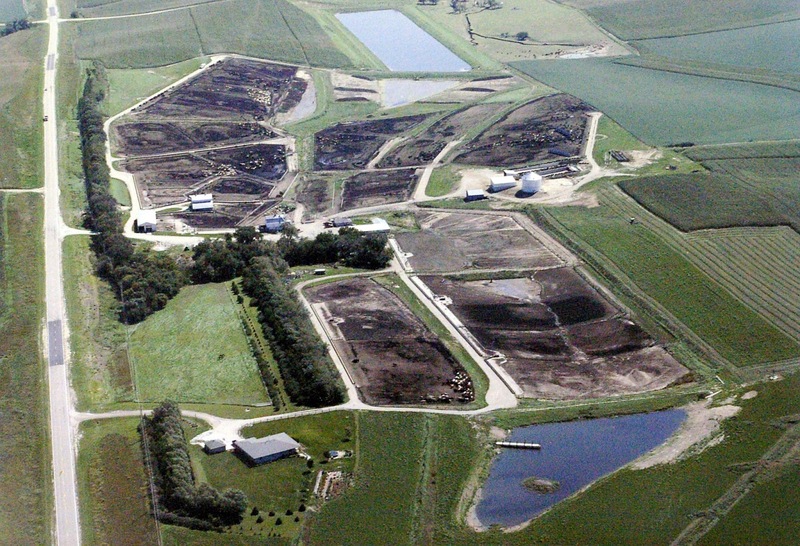 The geese seemed quite content to have cattle for neighbors and farmers for friends. nice place for family and friends to gather. 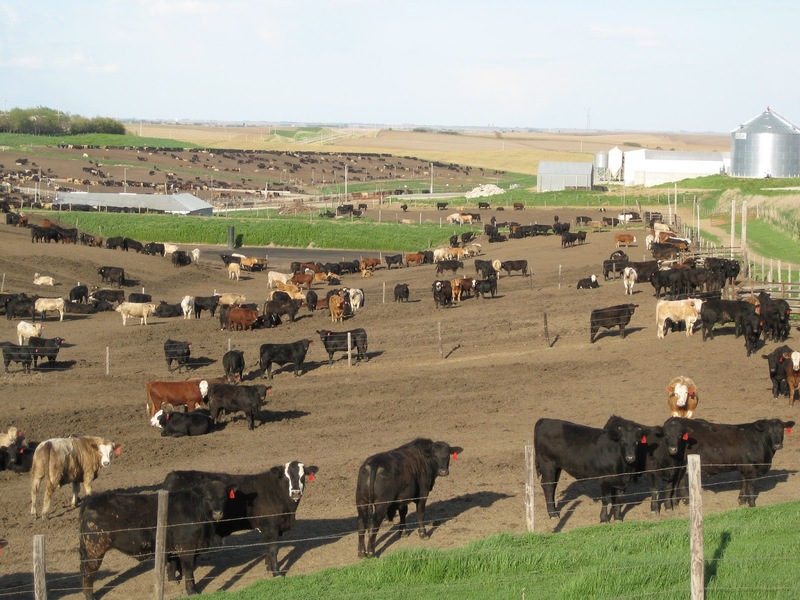 The cattle live in between the ponds. When fall came flocks of Canadian geese made their annual flight south for the winter. The mother goose, her mate and their goslings joined them knowing instinctively that Nebraska would turn cold. The winter season came, winds blew and snow fell on the farm. 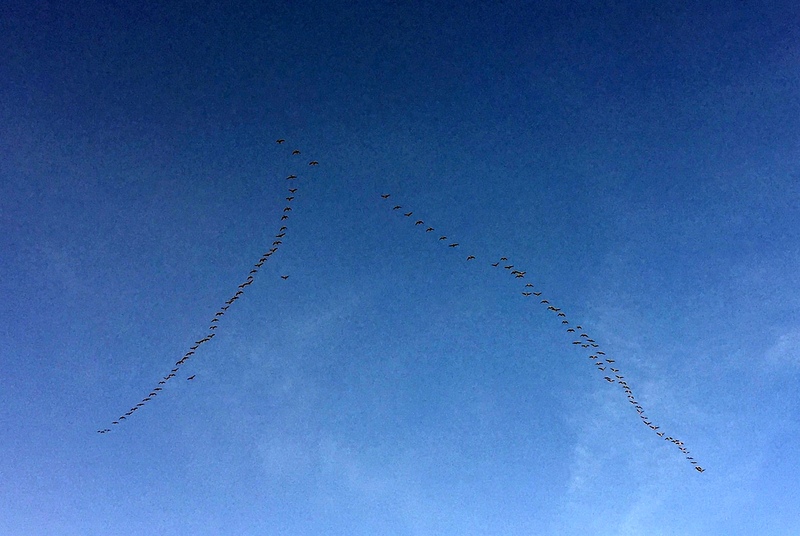 As spring approached the honks from Canadian geese flying north in their V formation were heard once again in the skies over the Nebraska farm. research studies on why birds fly that way here. It was during the migration north that the farmers heard a significant amount of honking on another pond close to their house. 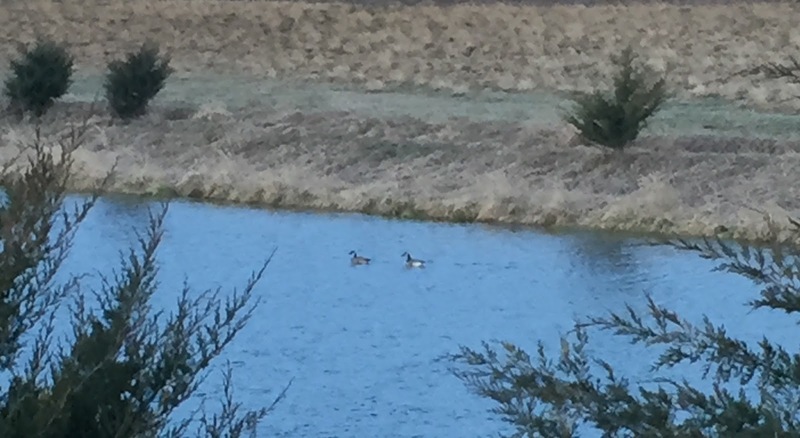 About a dozen geese were honking and splashing in the water on a one acre pond. They were flying around the farm, looking down on the cattle and then swooping back down on the water. 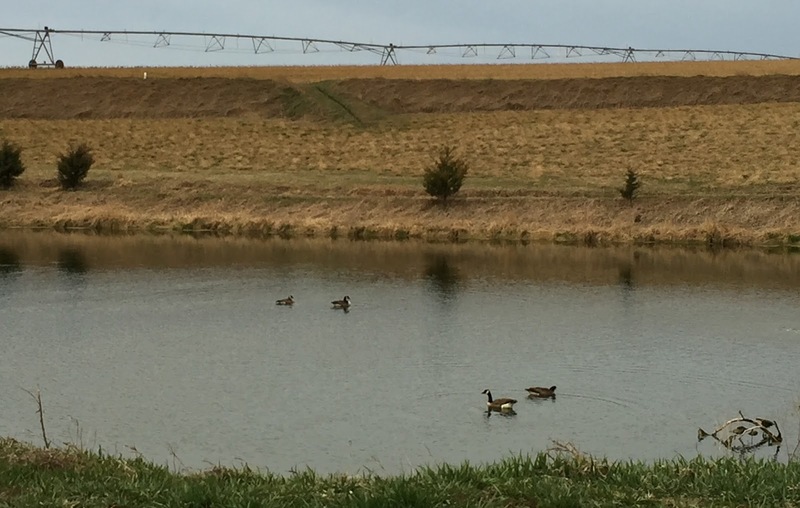 For about a week the geese played, honked and swam on the pond as the farmers continued their work with the cattle. The geese didn’t seem to mind Farmer Joan sitting on her 4 wheeler watching them. They didn’t seem to mind Farmer Steve stopping with the feedtruck to watch them play. Some of the geese enjoying a calmer day on the water. One morning it was very quiet on the pond. Farmer Joan observed that only one pair of geese were still there. A few days went by and it was apparent that the rest of the geese had moved on but this pair seemed intent on staying. Was this the same pair that had raised their family on this farm the year before? Did they decide to try raising their family on this smaller pond that the farm family also used for fishing, swimming and paddle boating? The goose and the gander swimming together. 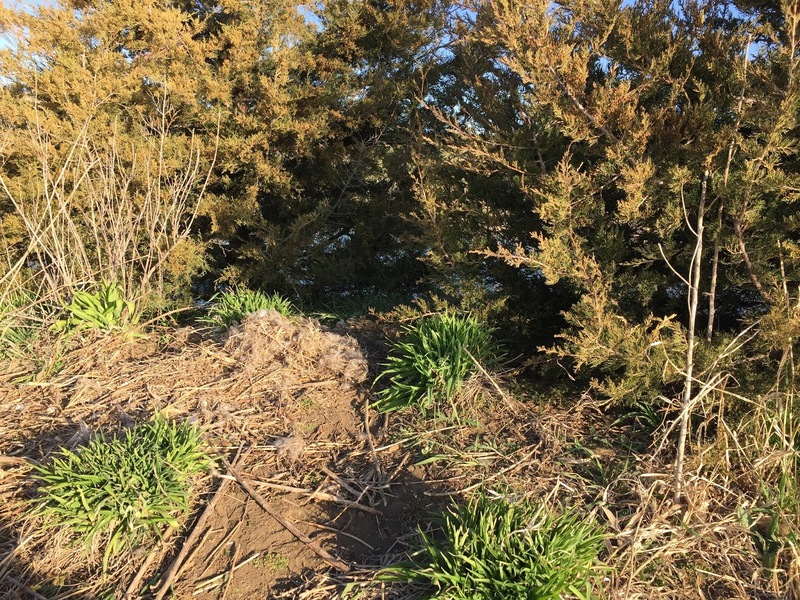 Yes, Farmer Joan and Farmer Steve noticed that mother goose had built a nest on a little man-made island in the pond. The nest was on the south side underneath a six foot tall Cedar tree. 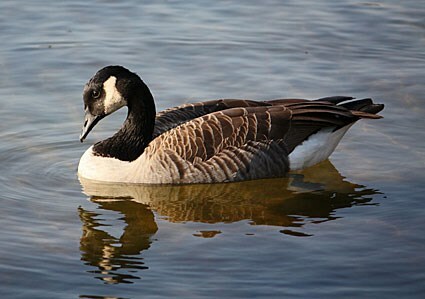 The mate would spend his day swimming around on the pond while mother goose could be barely seen curled up over the next of eggs. trees and some daylillies that are just starting to grow. A couple of weeks went by. The weather in Nebraska continued to have warm days and then cold days, very windy days and calm nights. The geese remained with one on the nest and one swimming nearby. And then something happened. Farmer Joan was going about her normal morning routine of checking the cattle when she noticed a small white spot on the north side of the little island. She also noticed the mother goose was not on her nest. Fear for the unhatched goslings siezed her as she recalled seeing two raccoons in the area the night before. Did the raccoons scurry across the little bridge and steal the eggs? As Farmer Joan approached the island she noticed one whole egg sitting by itself. Her motherly instincts kicked in as she picked it up with her gloves, and then another egg and another as they lay scattered about. 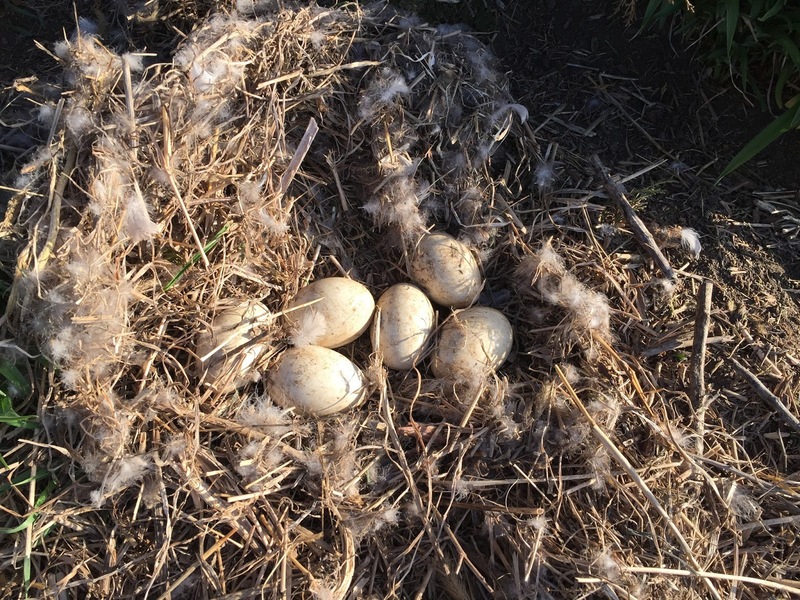 She tenderly put the six eggs back in their nest and covered them up with the grass and feathers the mother had used. The parents were nowhere to be seen. Sadness for the unhatched goslings filled her heart. The six eggs I put back in the nest. Farmer Steve was perplexed along with Farmer Joan as they tried to figure out what happened. Were the geese frightened by the raccoons? Or did the coyotes that run wild in the area find the nest? Maybe it was the fox they had seen running through a field the week before. Or did the mother goose abandon the nest for another reason? The forces of nature had definitely changed the outcome for six goslings. have to be.” If you’d like to read a few more quotes from Temple click here! A couple of days went by and Farmer Joan was still feeling sad about not watching the family of geese swimming on the pond all summer. Farmer Steve said he saw the pair back on the pond and perhaps they would start a new family all over again. Will they start a family on the same pond? Or will they go to the other side of the farm and start again where they had better luck the year before? Stay tuned as we wait, watch and wonder what they do!